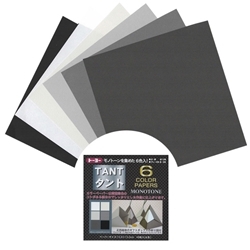 Monotone Tant Origami Paper comes in 12 different shades of black, white and grey. This paper features a crepe-like texture and color on both sides. From subtle accents to neutral-schemed projects, the Monotone Tant Paper is the perfect origami paper for any project. With a crisp and stiff texture, this crepe-like origami paper holds a sharp crease and responds well to wet-folding. The double-sided Tant origami paper is perfect paper for folding projects with sharp edges such as geometric shapes, modular origami, and kusudama. The Monotone Tant Origami Paper Pack includes 48 total sheets of origami paper along with free folding instructions! The Tant Paper Pack is also available in Blues, Yellows, Greens, and Reds.